Albuquerque began its acquaintance with Brett Hills after he landed here from Easton, Pa., with a degree from Lafayette College. He came to New Mexico in part because the skiing options, wide open spaces and mountains intrigued him. He went on to continue his education at the University of New Mexico where he earned his MBA at the Anderson School of Business. Hills has an entrepreneurial bent. After UNM, that bent launched him into the creation of a new company — 999dine.com — an e-commerce and marketing service for Albuquerque-area restaurants. Hills parlayed the relationships he made with eateries into a successful run at commercial brokerage with NAI Maestas & Ward. Since 2007, he has been involved in deals that include rollouts of Subway, Chipotle Mexican Grill, Five Guys Burgers and Fries, Five Star Burgers, Pei Wei Asian Diner, Filibertos and Einstein Bros Bagels among others. While a director at Maestas, he has developed a new company, ClaimMYrun.com. As a commercial broker, what strategies have worked for you? Creating and nurturing long lasting relations has been instrumental in my ongoing success. At the end of the day, people want to do business with their friends. I cherish the role of being a trusted adviser in helping people make sound business decisions. My biggest takeaway from 2013 has been that the ability to problem solve is more key than ever. Regardless of the size of the transaction or nature of the deal, the ability to be creative, think on your feet and pivot when necessary is paramount. I like to say that a deal is not a deal until it has cratered at least three times. The role of an adviser/broker is to bring the deal back to life. Is there room in Albuquerque for independent, franchise and national restaurants to thrive? Now more than ever there is a flight to quality. Consumers are selective with their disposable income and if they are not in the mood to wash dishes then they will certainly want a gratifying dining experience. The restaurateurs, regardless if they are chains or locals, that focus on quality, consistency, value and a high level of customer service will continue to thrive. Those who keep doing the same things and expect different results are in jeopardy. Albuquerque appreciates culinary innovation in new concepts which can be seen in the success of Zacatecas and Vinaigrette, both of which are relatively new to the restaurant scene and are making their mark. What’s the status of your skiing business? 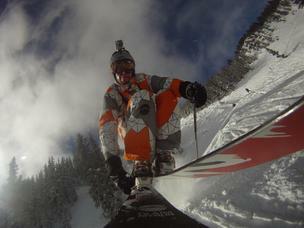 ClaimMYrun.com, which provides video trail maps for ski resorts worldwide, is charging hard into the third year. The ski industry is transforming how it touches its customers. Many experts are touting that 2014 will be the year of ‘content marketing’ which is all about inspiring new business and loyalty by delivering and amplifying relevant video footage through social media. This is especially true with the millenials who do not want to be sold. They are looking for authenticity. This is the very reason why an end user generated YouTube video is becoming so much more powerful than a high budget marketing contrived commercial. I feel we will continue to see a slow recovery from the recession. There is still interest and enthusiasm in Albuquerque from national retailers which will lead to more growth. We live in a beautiful state with great people and I am confident that 2014 and beyond will bear prosperity.